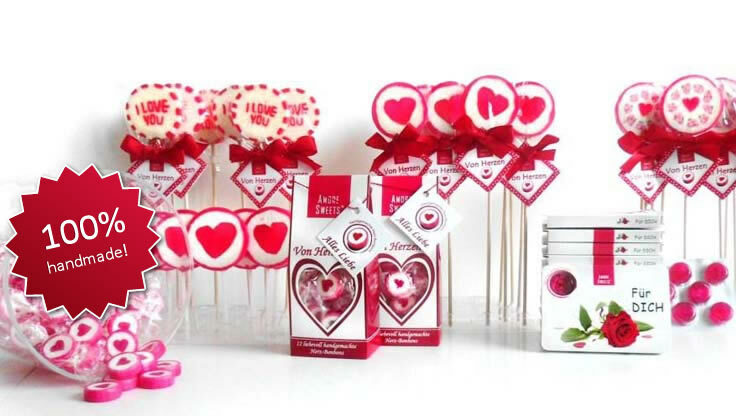 At AMORE SWEETS in Hamburg, Germany, we produce handmade candies and lollipops in beautifully designed gift packaging. Our exclusive, brightly coloured hard boiled sweets are made with great attention to detail according to a unique confectioner’s tradition that has become rare in modern times. This tradition is what makes each individual, eye-catching gift taste truly delicious. Our tasty sweet presents will enchant your senses and make a great gift for any celebration, party or simply between friends. These treats are painstakingly prepared and are also known as rock candies and rock lollies. We only use natural colours or non-azo colours. Our products are made without preservatives or fat and they are also gluten free. Love, Valentine’s Day, Birthday, Mother’s Day, First Day at School, Children’s Day, Wedding, Football, Christmas, Easter, Summer, Winter and also a universal theme “Just Because”. Let our products be your source of inspiration. We also produce special orders and private label products upon request. A minimum order volume is required. Choose from special candy and lolly motifs, your own individual packaging idea or packaging in other languages.